Our programs rely primarily on evidence-based methods that have been developed and researched as part of the larger science of Applied Behavior Analysis (ABA). Children with autism have the potential to learn, but they require teaching methods that are optimized for their needs. The most effective teaching methods available today for people on the autism spectrum have been developed within the science of ABA. ABA methods are supported by research and included among the national standards (or best practices) for autism. Contemporary ABA programs emphasize positive reinforcement and include concern for quality of relationship and social interaction. Although the Growing Minds team began with a play-based approach, our continuing search for better ways to help children led us to include ABA methods. We have been successfully integrating behavioral methods with play-based work for 14 years. In practice, ABA programs can vary considerably from one another. Our programs use Positive Behavior Support, ABA-Verbal Behavior methods as well as placing special emphasis on social reinforcement and parent training. Many people think of Behavior Analysis as a method for helping children with autism. This is a misunderstanding. Applied Behavior Analysis is a science. Behavior analysts ask “Why does behavior change over time?” The principles they discover are used to help people improve their functioning that benefit themselves and those around them. The application of behavior principles (known as Applied Behavior Analysis or ABA) is very broad, ranging from help for drug addiction to weight reduction, exercise, juvenile delinquency, toilet training, education, organizational structures and more. One particular area where the findings of behavior analysis have been applied successfully is in the treatment of autism. It may seem odd to use the word “behavior” to describe how we learn to talk, play, work and live as a complex social individual. But to a behaviorist, these are skills that can be taught, so long as the individual has sufficient brain functions to learn and practice the skills. This is the essence of the hypothesis that children can recover from autism – for many children, the difficulties of autism result largely from learning problems which can be overcome by particular teaching methods. Typically-developing children learn without special intervention – the world around them provides the right conditions to learn language, play and social skills. Children with autism learn much less easily from the environment. Although they have the potential to learn, they require teaching methods that are optimized to help them acquire the same skills that typical children learn more “naturally.” One focus of ABA is creating these optimal teaching methods and conditions. Many ABA methods are now included in the national standards for “best practices” for autism. The field of autism treatment includes both vigorous supporters and vigorous critics of ABA methods. Many outspoken critics lack training or direct experience in ABA and their criticisms are actually aimed at the “Lovaas method”, one early ABA approach that emerged in the 1970’s. ABA has continued to evolve and, over time, more and more effective methods have been developed. Today there are a spectrum of well-researched methods and programs that have their origins in ABA. Originally focused on speech acquisition, cognitive development and behavior problems, various ABA programs and methods now incorporate concern for quality of relationship, social skills, leisure skills and other dimensions of the child’s life. Our methods are grounded in well-researched behavioral principles. We assess each child’s skills and create individualized education plans. When appropriate, we use ABA methods, including discrete trial teaching, fluency training, natural environment training, errorless learning, antecedent intervention, functional assessment, differential reinforcement, shaping, chaining and the best of what ABA has to offer in helping children grow and learn. 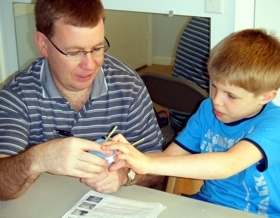 We train parents and others working with the child in these teaching methods. We use data gathering methods and recording methods to determine that the child is growing and learning. We do not rely on an intuitive feeling that progress is being made. We encourage parents to create a special play/instruction room in the house that is free from distractions and is an optimal environment for teaching and interacting. Core lessons are taught first in the playroom, and then “generalized” to other environments. Parents are trained in all aspects of program and can take a directorial role. We advise, instruct and encourage, but the parents make the decisions. We alternate instruction times with intensive play interaction times. Instruction times often include discrete trial teaching at a table. During these times, the adult directs the child. During intensive interaction times, the child takes the lead in play. In this way, the children learn to be both cooperative and self-assertive. The child needs to understand clearly whether it is an intensive interaction (play) time, or an instruction time. We teach parents to make this very clear so that there is no confusion. While many ABA programs recognize that the attitude of parents and teachers is important, we place major emphasis on this, including training for parents and teachers (as necessary) to develop optimum attitudes toward setbacks, unwanted behaviors, etc. We train therapists and parents to use special techniques to make themselves more reinforcing for children on the autism spectrum (‘pairing”), to be more effective at social reinforcement, and to make their gestures, facial expressions and modeled actions more salient for children with autism. These techniques are all based on behavioral principles and are used to make therapists more effective at implementing evidence-based strategies. During intensive play interaction, children are given more opportunities to request (“mand”). Therapists or parents have more opportunities to associate (or ‘pair’) themselves with reinforcers. There are opportunities to assess reinforcers and for methods like time-delay, stimulus/stimulus pairing, extinction, etc. Discrete trials can be “peppered” into play, creating more opportunities for generalization. In other words, the play interaction times are opportunities to implement methods that incorporate both play interaction and evidence-based ABA strategies.